Virtual reality is going to the movies and Hollywood's excited about it. Or, at the very least, the execs at 20th Century Fox's specialty division Fox Searchlight are cautiously and thoughtfully wading into the deep end of this new medium. For its film Wild, starring Reese Witherspoon and Laura Dern, the studio has crafted what it's calling a companion VR piece with the help of Montreal-based VR artists/directors Paul Raphaël and Félix Lajeunesse, and it was demoed at CES in Las Vegas this week for select press. But the VR of Fox's Wild, based on a novel about one woman's journey of self-discovery while hiking the Pacific Trail, isn't your typical mixture of flashy computer-generated graphics and gaming. There are no whiz-bang effects to assault the senses and deliver that cheap and obvious "wow" factor. It's much more simplistic than that. 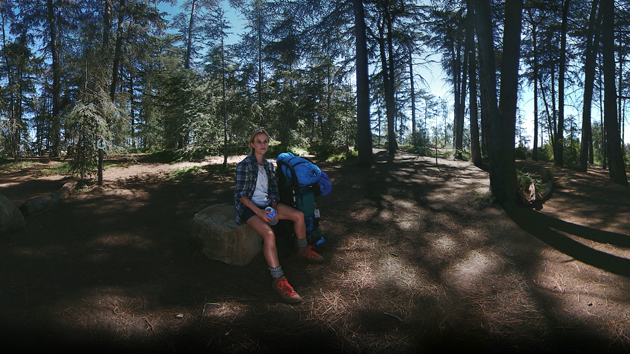 It's merely you, the VR viewer, strapped into a Samsung Gear VR headset, sitting on a virtual tree stump in a forest, listening and observing as Witherspoon's character walks up a trail, rests on a rock next to you and engages with the ghost of her mother (played by Dern). And that's by design, as the film's executive producer David Greenbaum explains: "A lot of people, I think, think about VR in terms of science fiction and sort of big effects. And I think what's very compelling about ... VR is sometimes the simplest experiences are the most profound." If you've followed any of the chatter around VR in the past year and a half, then you know what Greenbaum's referring to is called "presence," the somewhat elusive key to unlocking a truly immersive experience. It's what co-directors Raphaël and Lajeunesse began talking about nearly a decade ago when the pair was exploring work in 3D cinema, way before VR had re-entered the scene as a plausible consumer technology. "We thought it was kind of not getting treated with the kind of respect it should," Raphaël says of 3D cinema at the time, "in the sense that it was kind of just being slapped onto cinema instead of being a wholly original medium. And we did a lot of experimentation. ... And around the time we were ready to do that, VR came along. ... It kind of felt like 3D wanted to be VR." There are no whizz-bang effects to assault the senses and deliver that cheap and obvious "wow" factor. 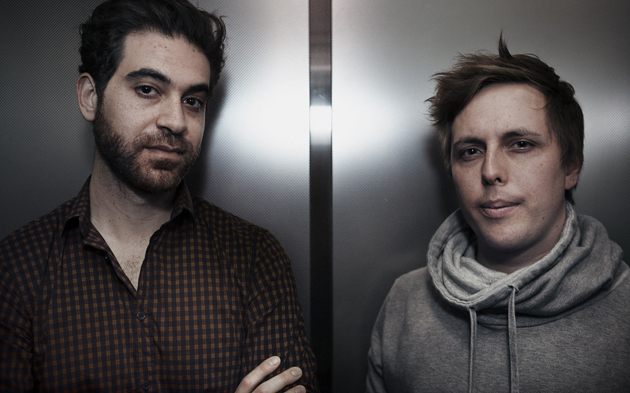 The technology and equipment Raphaël and Lajeunesse developed during that period also helped ease the pair into their new roles as pioneers of VR filmmaking. "When VR came along, we felt it was like an epiphany moment," says Lajeunesse. "That was clearly the thing that we had to do. There was no ambiguity for us. ... Everything that we had designed technology-wise was also pointing into that direction." That suite of VR kit includes original software, a post-production workflow and an ever-evolving, custom camera rig outfitted with an array of sensors. A camera Raphaël says is dressed up like a person. "It's got a head and body," he says. "We treat it as a person because wherever we put it is where we're putting our viewer." But, as Lajeunesse explains, shooting in VR is about more than just the technical aspects. The human element is actually what cements it as a whole new entertainment frontier and transcends the medium above traditional 2D/3D cinema. "We saw the film ... and we understood why [Fox] wanted us to think of a VR experience for that because we really believe in the power of virtual reality to communicate human intimacy, human proximity and sort of a pure emotional human experience," says Lajeunesse. "And this film is about that ... And that level of intimacy is the kind of approach that we're interested in for virtual reality." Reese Witherspoon in the VR short "Wild - the Experience." That sensation Lajeunesse describes of proximity or actually "being there" manifests through the shifting perspective of the three-minute VR experience, and it all hinges on where you look. "Who you are evolves throughout the piece from being yourself to being perhaps an omniscient viewer, but that is present," says Raphaël. Lajeunesse continues, "If you look at Reese, somehow you become Laura. If you look at Laura, somehow you become Reese." And that subjectivity is entirely dependent on the piece's audio and head-tracking tech since Dern's character doesn't actually appear next to the viewer until the viewer, hearing her voice come from a specific direction on their right side, turns to look. As Fox's resident Futurist Ted Schilowitz explains: "One of the things that VR allows you to do is set up triggers. But it's really unusual to do it with live action because you expect live action to just be captured as it is. But there's actually some movie magic going on." "When VR came along, we felt it was like an epiphany moment," says Lajeunesse. Again, Raphaël and Lajeunesse incorporated that element of "reactivity," as the pair prefers to call it, intentionally. "It's not a linear experience in the sense that depending on where you look, the event of Laura's character's apparition might happen or not," says Lajeunesse. "And the behavior on how all of that unfolds in the story depends on your behavior as a viewer. And people don't notice it. ... It just subconsciously increases your feeling of belonging to the moment and being a part of it." For now, Fox's Wild VR experience is something that only festival attendees will get to see -- though visitors to Samsung's CES 2015 booth got a chance to check it out as well. It's a solid proof-of-concept for Twentieth Century Fox Home Entertainment's new Fox Innovation Lab initiative, the arm dedicated to advancing film through near- and far-term technology. Certainly, more VR experiences are on the way. Head of Production Ted Gagliano says the studio is evaluating its slate to determine which projects would be a good fit for future companion pieces. "We are talking about a number of other projects. The Martian with Ridley Scott, I think we'll do something; Night at the Museum, we might do something," says Gagliano. "The X-Men movies we start shooting, so they are naturals to do some sort of project with it. We already did a little piece at [the San Diego Comic-Con] in Cerebro with Professor X looking for mutants, so that's been done. Then we also have another Planet of the Apes coming, so there may be an opportunity on that one as well. I mean, hopefully, each movie will find a story that warrants a companion piece." 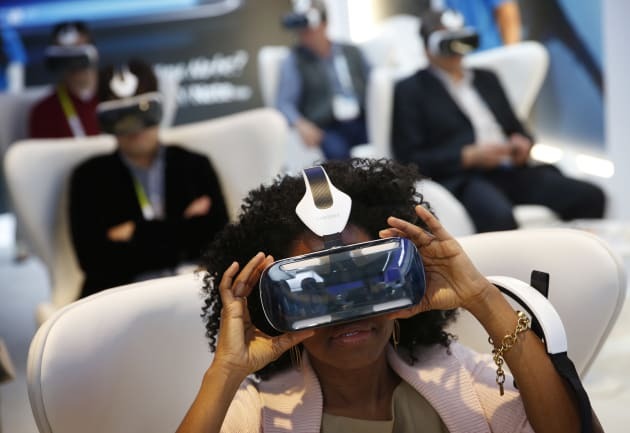 Attendees try on Samsung's Gear VR headset at CES 2015. Fox's enthusiastic and early embrace of VR should help the studio get a leg up on competitors when VR truly hits that commercial sweet spot and begins to infiltrate households as an accessible technology. Which is why Greenbaum says it's going all-in now, instead of being left behind when the shift happens. Or as Schilowitz so succinctly puts it: "Do you embrace [VR] and figure out how you're going to play an important part in that, as well as supporting the physical movie theatre and blending them together in some fashion. Or do you try and pretend it doesn't exist and doesn't catch on?" "We like Oculus because they have a renegade spirit; they like a developer community. They're not about keeping things locked up," says Schilowitz. "The most important thing we keep saying to each other is that we don't really know much yet," Greenbaum says. "Everything, every project, every discussion, every meeting is always a learning experience. And the rules aren't really established. The narrative tools and rules and technologies are evolving very, very quickly. So, I think our hope is if we just keep working on these projects, we'll get better at them; we'll learn how to make them; and there'll be more of them." When that day does come, Schilowitz says consumers can expect to download Fox's VR experiences on a host of available headsets. The Wild piece may appear as an exclusive Gear VR experience right now, but that's because that headset is the first to be commercially available. "By no means is it only going to be [just] Gear VR from a studio perspective," he says. "We explore all the options. ... We like Oculus because they have a renegade spirit; they like a developer community. They're not about keeping things locked up." As for a potential partnership with Sony and its Project Morpheus VR headset, Schilowitz was less bullish, saying that the Japanese company's "more focused on [developing] in their sphere." Though he didn't rule out the possibility of one day creating VR pieces for Morpheus. 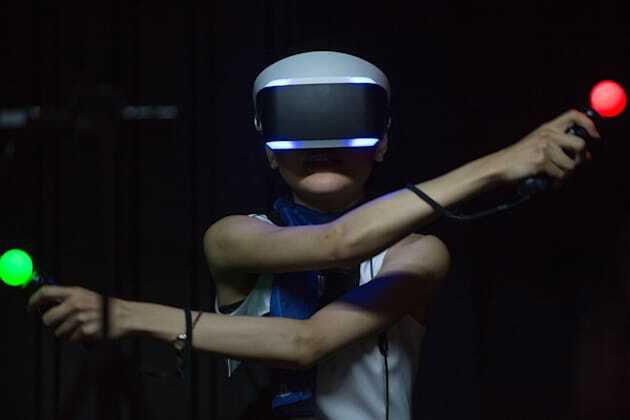 A rep demos Sony's Morpheus VR headset at the 2014 Tokyo Game Show. Not every VR project coming out of Fox Innovation Lab is going to take the shape of a companion piece. Gagliano says that these current experiences are essentially "a marketing tool," but that he hopes the studio will pursue the creation of serialized projects akin to what consumers are seeing on streaming services like Netflix. "Maybe it's 10-, three- or four- or five-minute experiences that are a serial of a full-length story. ... Everything's going that way, anyway, whether it's House of Cards. You know, these are all long stories that could also be movies and have the technical level of a movie." Raphaël certainly agrees. He and Lajeunesse believe that method of storytelling suits the current limitations of VR. "I think an interesting thing to do is create a series of short-form content that create a larger whole," he says. "I don't think anyone's ready either creatively or technically to spend two hours watching a VR film today. So, you know bite-size pieces that build." It's an anecdote of Greenbaum's from filming, though, that really drives home just how new and transformative VR has become for Hollywood. Of Dern's experience shooting the short, Greenbaum says: "When we shot the piece, a really interesting story about her was that she compared it to her experience on Jurassic Park. So when we were sitting in the trailer, and Félix and Paul, our directors, were sitting with her and she said, 'You know, this reminds me, as you guys are describing this, what I was thinking when we made Jurassic Park, which was 'This is crazy! And maybe won't work at all.'"